Electron Affinity of an element is defined as the amount of energy released when an electron is added to a neutral gaseous atom in its lowest energy state that is, ground state to convert it into uni-negative gaseous ion. In simple words, the electron affinity of an atom is defined as the energy liberated when a gaseous atom captures an electron. Evidently electron affinity is equal in magnitude to the ionisation energy of the species formed. The definition of electron affinity as the exothermicity of the electron capture reaction would lead to the negative sign according to our usual thermodynamic convention. But electron affinity is normally describes with positive sign. Negative electron affinities are known. These negative values indicate that the species concerned does not like to have any more electron. Electron affinities are difficult to obtain. These are often obtained from indirect measurements, by analysis of Born-Haber energy cycles in which one step is electron capture or by the direct study of electron capture from heated filaments. Larger the atomic radius lesser the tendency of the atom to attract the additional electron towards itself and lesser is the force of attraction exerted by the nucleus on the extra electron being added to the valence shell of the atom. 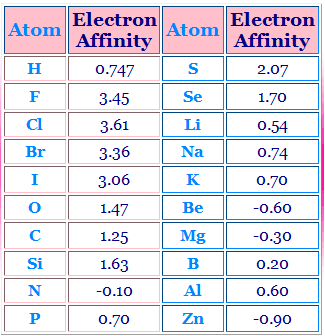 Thus Electron Affinity values decreases with increases atomic atomic radius. Higher the magnitude of effective nuclear charge (Z⋆) towards the periphery of an atom greater is the tendency of the atom to attract the additional electron electron towards itself. Again greater the force of attraction exerted by the nucleus on the extra electron being added to the valence shell of the atom. As a result higher the energy released when extra electron is added to form an anion. Thus the magnitude of Electron Affinity (EA) of atom increases with increasing Z⋆ value. valence shell configuration posses very low electron affinity value due to having their stable valence shell configuration. These elements posses filled S-Orbital in their valence shell which is stable hence Be and Mg do not prefer to except the additional electron in order to form anion. In such cases energy is required to form anion and consequently the electron affinity of Be and Mg posses negative sign with low magnitude. From the above discussion it is clear that elements of Group - IIA posses low electron affinity vales with negative sign due to stable nS² valence shell electronic configuration. Complete lack of evidence for stable noble gas anion is sufficient prof of their low electron affinity. An electron, even if accepted by a noble gas atom, would have to go into an orbital of next quantum shell and presumably the nuclear charge not high enough to hold an electron placed so far out. 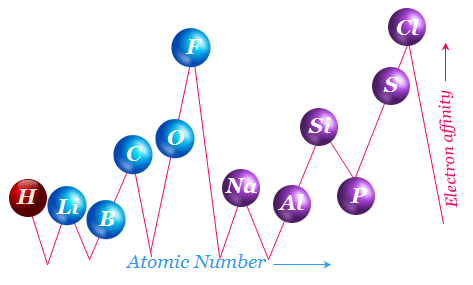 In a group when move from top to bottom the size of atom generally increases with increasing atomic number and consequently the magnitude of electron affinity decreases in the same direction. Although the elements of the second period of the periodic table are relatively smaller in size than those of the third period elements, but the electron affinity values of elements of second period is smaller than the electron affinity values of third period elements. This unexpected behavior is explained by saying that the much smaller sizes of the second period elements give a very much higher value of charge densities for the respective negative ions. A high vales of electron density is opposes by the inter - electronic repulsion forces. Electron Affinity of fluorine is lower than that of Chlorine. The lower values of electron affinity for Florine due to the electron-electron repulsion in relatively compact 2P-Orbital of Florine atom. In a period, when we move from left to right Z⋆ value towards the new coming electron gradually increases with the increasing atomic number and hence the electron affinity gradually increases in the same direction. 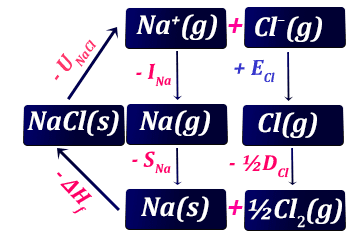 Calculate the electron affinity of chlorine from the Born - Haber cycle, given the following date : Lattice Energy = - 774 kJ mol⁻¹ , Ionization Potential of Na = 495 kJ mol⁻¹, Heat of Sublimation of Na = 108 kJ mol⁻¹, Energy for Bond Dissociation of chlorine (Cl2) = 240 kJ mol⁻¹ and Heat of Formation of NaCl = 410 kJ mol⁻¹. Account for the large decrees in electron affinity from lithium to beryllium despite the increase in nuclear charge. Lithium has an incompletely filled 2S sub-shell while beryllium has the sub shell filled. Thus lithium can receive an electron in its 2S sub-shell but for beryllium a still higher energy 2P level has to be made of. A filled shell or sub-shell leads to some extra stability. Hence beryllium resists an extra electron more than does lithium. Why electron affinity of Nitrogen is - 0.10 eV while that of Phosphorus is + 0.70 eV ? Due to smaller size of Nitrogen atom when extra electron is added to the stable half - filled 2Porbital some amount of energy is required and hence electron affinity of nitrogen is negative. On the other hand, due to bigger size of P atom in compare to nitrogen less amount of energy released when the extra electron is added to the stable half - filled 3P orbitals and thus electron affinity of Phosphorus is expressed with positive sign. Explain why electron affinity of chlorine is more than fluorine? The halogen possess large electron affinity values indicating their strong tendency to form anions. This is easily understandable because their electronic configurations are only one electron short of the next noble gas element. The electron affinity of chlorine is greater than that of F. This is probably due to very small size of F atom which results in a very high charge density and consequently strong repulsion between existing valence shell electrons and the entering electron (new coming electron). On the other hand Cl being bigger size , charge density is small and thus such repulsion is not strong enough. Hence the electron affinity Cl is greater than that of F.
Why electron gain enthalpy of Be and Mg are almost zero? Be and Mg have their electron affinity values equal to almost zero. Since Be and Mg have completely filled S orbitals. The additional electron will be entering the 2P-orbital in the case of Be and 3P-orbitals in the case of Mg which are of considerably higher energy than the 2S- Orbitals respectively. Why electron affinity of noble gases are zero? Inert gases in which the nS and nP orbitals are completely filled (nS² nP⁶ configuration) the incoming electron must be go into an electron shall having the larger values for the principal quantum number, n.
Thus inert gas have their electron affinity values equal to zero.